Adult flatfoot is defined as a foot condition that persists or develops after skeletal maturity (growth plate closure) and is characterized by partial or complete collapse of the arch. Symptomatic simply means “with symptoms” or pain and asymptomatic means “without symptoms” or without pain. Both types are typically treated conservatively with Custom Orthotics, at least initially. Orthotics help hold the foot in an optimal position to help prevent the progression of the deformity. 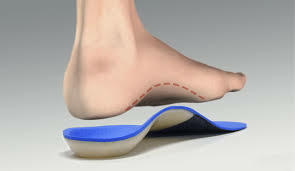 If a patient is still having pain while wearing Orthotics, surgical correction may be necessary. A flexible flatfoot is one that has a normal appearing arch when non-weight bearing, but once the patient stands, the arch collapses. A rigid flatfoot has a stiff, flattened arch when both weight bearing and non-weight bearing. Flexible and Rigid Flatfeet may be either symptomatic or asymptomatic. Rigid Flatfeet typically are caused by an underlying condition (i.e. Posterior Tibial Dysfunction or PTTD) and may require special consideration. There are other types of Adult Flatfoot, such as those caused by injury or disease. Adult Flexible (non-PTTD) flatfoot is generally a progression of a pediatric condition characterized by partial or complete loss of the medial arch. This is due to abnormal biomechanics (abnormal pronation), which may come from a variety of factors: compensation for abnormal motion in the forefoot, tight Achilles’ tendon (Equinus), muscle imbalance, ligament laxity, and obesity. Posterior Tibial Tendon Dysfunction (PTTD) is the most common cause of adult acquired flatfoot. The Posterior Tibial Tendon is a large tendon that supprts the arch. Dysfunction of the Posterior Tibial Tendon is caused by damage or pathologic changes within the tendon. PTTD arises when the tendon becomes inflamed, stretched, or torn. Left untreated, it may lead to severe disability and chronic pain. PTTD is usually progressive and results in a flexible to rigid flatfoot, depending on the stage of the condition. People are predisposed to Posterior Tibial Tendon Dysfunction if they have flat feet or an abnormal attachment of the tendon to the bones in the midfoot. Depending on the type of Flatfoot, treatment may be either non-surgical or surgical. Activity Modifications: The patient may need to temporarily stop painful activities. Weight Loss: This can be an important factor in decreasing painful symptoms of flatfeet. Orthotic Devices: Patients with painless flatfeet are typically placed in a Custom Orthotic device and the condition will be observed and re-evaluated by the foot and ankle surgeon. Physical Therapy: Stretching exercises, icing, formal Physical Therapy by a Physical Therapist, supportive taping and bracing may be necessary as well. Shoe Modifications: The foot and ankle surgeon will advise you on footwear characteristics that are important for the child with a flatfoot condition. In some cases, surgery is necessary to relieve the symptoms and improve foot function. Foot and ankle surgeons provide a variety of techniques to treat the different types of pediatric flatfoot. The surgical procedure or combination of procedures selected for your child will depend on his or her particular type of Flatfoot.